One thing I like about the Internet is the instant access to information and resources. It allows you to re-live some things and helps take you back to past times that were precious to you. When I was in my early 20's I served as a Pastor in a small church in West Yorkshire. I play guitar and introduced many new songs and styles of worship to the congregation. I even formed a group from some of the young people and we sang and worshipped in quite a few places. One of my favourite artists from that era is an American gospel artist called Andrae Crouch. He was different, very real. More a worshipper than a performer. I managed to see him live on his tours to Britain in the 1970's and was never disappointed. 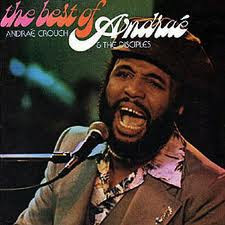 I have several vinyl LP's of him my favourite being 'Best of Andrae Crouch and the Disciples'. Sadly I have no record player anymore but I was able to buy a couple of remixed Cd's a few ears ago with all the favourite songs on them. I love music, love playing guitar and singing. I am a worshipper. Songs are more than sentiment and words to me but a way of discovering the reality of God's presence in my life. Many times when I listen to music I weep, not because of memories it invokes but truth it speaks of. I love the old Wesleyan hymns because in them is such amazing doctrinal truth. I often find songs speak more accurately of God's truth than sermons. Worship in song has done many things for me. It has broken depression, brought deep inner healing, inspired prophecy, released joy and happiness. I remember one beautiful memory when I was in a meeting years ago. A man I knew was attending and had a serious heart condition that threatened his life. I was with him in the meeting when someone performed a song, 'Rise and be Healed'. As it was sung the man I knew stood to his feet in faith in response to the words and was totally healed. A very special memory indeed. The love for music was imparted by my father. He was not a spiritual man, far from it. He had a great voice. He would sing to me songs his mother sang to him as a child. He was born 1905 so you can imagine the sings were very unfamiliar to me and from an era long gone. I still remember them. The memories are probably the only sweet memories I have of him. His love of singing gave me a love of singing. He was a pub singer, me a gospel singer. In his last days my music was what he heard. The songs of faith and hope. I took him to church one day and he wept as the hymns were played. A few weeks before his death from cancer he made peace with God. His song could have been so different. He would have made a great gospel singer. Music and song have paid a big part in my journey. I understand why David has so much to say in song in the Psalms. My song has changed over the years. My new understanding means that some songs that were precious I can no longer sing because the words are not accurate. So new songs need to be written and sung.